Third time is a charm they say, and Nintendo did it, taking the power of the Gameboy advance to the edge they released one of the better, if not the best, platformers right into the Gameboy advance. Yoshi’s Island, the game that was bundled with the Snes 2 and probably one of the few that gave the perfect use to the SFX-2 Chip saw its release as Super Mario Advance 3. Taking on Yoshi who helps Baby Mario get to his lost brother Baby Luigi, you travel through Dinosaur Island and meet with Snifits, Shyguys, Shyaways and Kamek to defeat Baby Bowser. Of course, you can connect up to 4 players to play Super Mario Bros, a staple now of the Advance series. The game includes all the levels and 6 “advance exclusive” new levels. Narrator: A long, long time ago... This is a story about baby Mario and Yoshi. A stork hurries across the dusky, pre-dawn sky. In his bill, he supports a pair of twins. Suddenly, a shadow appears in a gap between the clouds and races towards the stork with blinding speed. Kamek: "THE BABIES ARE MINE!" Meanwhile, here is Yoshi's Island, home to all Yoshies. It's a lovely day, and Yoshi is taking a walk. HUH?!? Suddenly, a baby drops in onto his back. The baby seems to be fine. This is very fortunate! Wha-? Something else fell with the baby... Let's take a peek... It looks like a map. Maybe the stork was using it? But Yoshi can't figure it out. Yoshi decides to talk to his friends. Narrator: Kamek, the evil Magikoopa, and kidnapper of the baby, quickly dispatches his toadies, when he discovers that he missed the other baby! Yoshi heads leisurely back to the other Yoshies, unaware of the danger at hand. 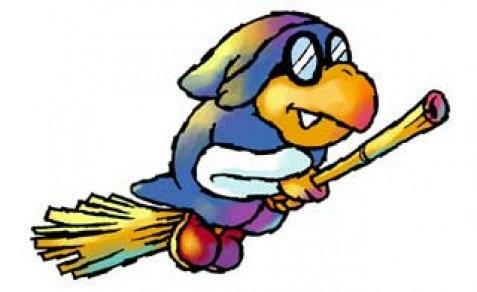 Kamek's forces are actively searching the island. Will these two children ever reach their parents safely? Narrator: This paradise is Yoshi's Island, where all the Yoshies live. They are all in an uproar over the baby that fell from the sky. Wait! The baby seems to know where he wants to go... The bond between the twins informs each of them where the other one is. The Yoshies decide to carry the baby to his destination via a relay system. 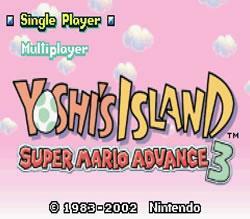 Now begins a new adventure for the Yoshies and baby Mario. Perhaps you'd prefer to watch the opening / intro video for Super Mario Advance 3 instead? That explains the story pretty well. The mini battle code now is LLBAR while holding select, sadly there is no 2-player mode. The countdown timer ticks every second now, instead of twice per second. The pause menu has been split on two, start allows you to set the Gameboy to sleep if a break has to be taken, the other menu displays your items. Due to a lack of a backlight, the colors of the palette have been lightened. The Pink and Red yoshis now have more consistency, they appear the same in the map and in the world they are beating. The Yoshis have different colors, according to their own color like in Yoshi’s Story. The Fuzzy effect is way less intense. Red coins are SUPER HARD to notice on this version. There is a Glitch that causes some sparkling objects on underground levels to have their palletes switched around. The Magic Effect of Kamek is different. The overworld map had a full redesign, now it follows a straight line, spots have been added to the map for each world two hidden levels and a world select screen has been added. Baby Luigi is shown on the spot of the 6th world if 6-8 has not been finished. After defeating the final boss, the file on the file select screen, the world “CLEAR” will appear, alongside an image of Baby Bowser. The soundtrack suffered a downgrade due to the capabilities of the Gameboy Advance. Every Boss has the same musical opening now. Many sounds were replaced by sound clips, Yoshis’ and Shy Guys’ voices particularly. The sound effects of Yoshi were replaced by Yoshis’ voice clips. The Baby who cried on the Snes was a stock effect, now there is a cry, voiced by Charles Martinet. The original cry was deroged to Luigi. The credits are shorter, crediting the original YI staff only on the Special Thanks, not even Shigeru Miyamoto is credited. Don’t think the lack of the X and Y button will make this game harder, the L and R button cover for most of the functions of those buttons. Yoshi has his flutter jump, achieved by keeping A pressed. 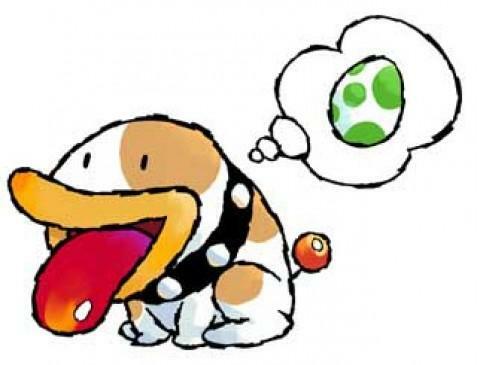 B leashes out Yoshi’s long tongue to eat on enemies and he turns them into eggs by pressing down or spits them out with B, you can control de direction where you spit them. Pressing R brings out the crosshair, which you can lock with L to shoot an egg on that direction. Start pauses the game and select brings up the item selection menu, which also shows the current score of the level. 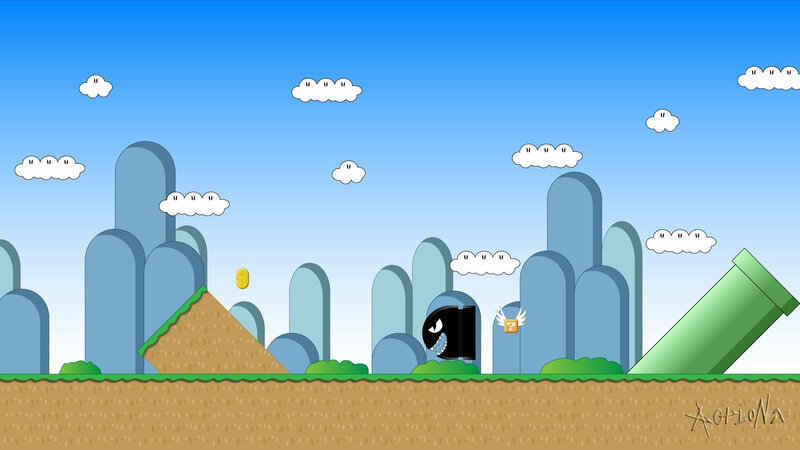 World 1: Taking place in a grass field, this world has all the kind of stages that will be presented on the rest of the game, caverns, sky stages, The Boss of the world is Salvo, The slime. World 2: A mountainous region with the introduction of enemies such as the Baseball Boys and Ghosts, the Boss of the world is The Potted Ghost who waits on their castle. World 3: Is right on the middle of a jungle with many water sections, the boss is Naval Piranha. World 4: A sunset landscape has a lot of beautiful scenery that will keep Yoshi and Baby Mario Distracted, Hookbill the Koopa is the boss. World 5: Total contrast from the last world, an Icy mountain with several enemies and snowball mayhem, Raphael the Raven is the boss.World 5: Total contrast from the last world, an Icy mountain with several enemies and snowball mayhem, Raphael the Raven is the boss. World 6: Finally on Bowsers’ Kingdom, lava, spikes, barrens and finally Bowser, the King himself as the final boss of the game. The game was well received, selling 1.6 million copies overall, re-released as a Player’s Choice title in 2006. IGN gave it an 8.6 and a Great rating, while GamePro gave it a 91, both sites praised its similarity to the SNES title but complained alike on the lack of intuitive controls. Funguz scored the remake 10/10. 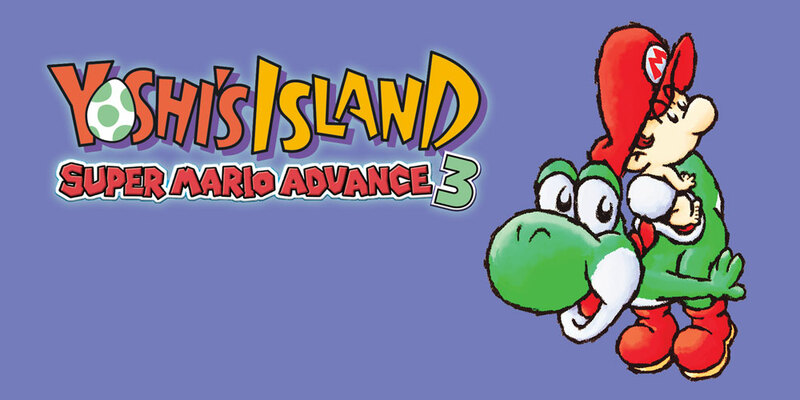 Some videos featuring Super Mario Advance 3: Yoshi's Island including TV Commercials and game trailers. In the German version of the game the level “Touch Fuzzy, Get Dizzy” is called “Lustiges Sporen Drama” which makes reference to LSD, the psychedelic drug. Hidden on the game data there are different transformations of Yoshi, they include a Mushroom, a Plane and a tree! Thanks to a rebellious action by Shigeru Miyamoto the game ended looking as it does now, the Nintendo Committee wanted a realistic looking game with pre-rendered graphics like DKC, so he ended up asking the artists to make the game look as if it was drawn with crayons.